Ambush attackers depend on consistency. They time sequences. They count on the predictability of habits. They approach while avoiding recognition until they strike. Unknowingly, many retail businesses, especially banks, enable a criminal’s ability to plan their attack by standardizing the building designs, secured access points, and operating procedures. Criminals have become very efficient in exploiting these practices. There a number of ways to create uncertainty slanted toward the nefarious types, while still extending hospitality toward the visitors and customers were eager to serve. Law enforcement and security experts agree that a simple yet effective way to avoid or deter ambush attacks is to maintain “situational awareness” by greeting people entering your place of business while making eye contact with them. 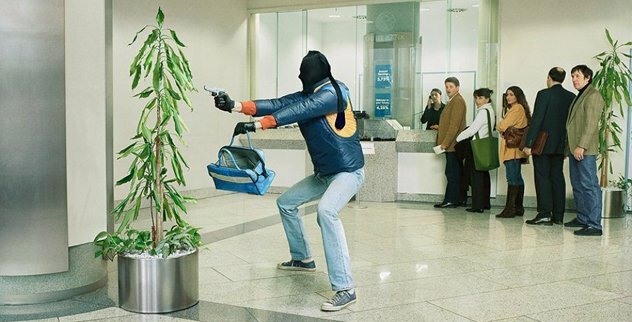 This most basic practice denies would-be robbers or attacker’s anonymity. Remember they don’t want to be noticed. Criminals are experts at defining easy opportunities. They will pass on environments where they’ve been recognized or have to meet criteria to gain entry. Criminals find it too risky to attempt passage through entrances that require credentials or that can detect and prevent weapons from coming into the building. These types of entrances can isolate a would-be attacker and also prevent swarming types of takeover attacks. Entrances and buildings safeguarded by automated technologies are hostile environments for criminals. Attackers can overwhelm a known security measure like a guard, but not an unseen yet omnipresent security countermeasure. They’re left to guessing what may or may not be detected or what happens upon detection. Either aspect creates uncertainty and encourages would-be attackers who are more concerned with getting away then getting in. In their way of thinking, it would be better to find a less formidable target. For us pedestrians, creating uncertainty for criminals with elegant security measures are pretty much non-existent or nonchalant, because they don’t affect us; to a criminal, they’re huge warning signs…Creating uncertainty for would-be perpetrators wins the battle before it starts, while we go about our daily business. To learn more, or to learn how Isotec Security Inc. can help you protect your facility, call us today at (303) 974-7699 or contact our Sales Director Matt at msamels@isotecinc.com. This entry was posted in Active Shooter, Banks & Credit Unions, Commercial Facilities, Isotec Security, Uncategorized and tagged Active shooter plan, Bank Security, Metal Detection, Weapons Detection. Bookmark the permalink.